“Hey Cortana” on Windows 10 is a feature that lets Cortana recognize your voice and help you wake your personal assistant by calling its name. As the feature is disabled by default, follow this post to see how you can enable Hey Cortana to avail all of its functionality. 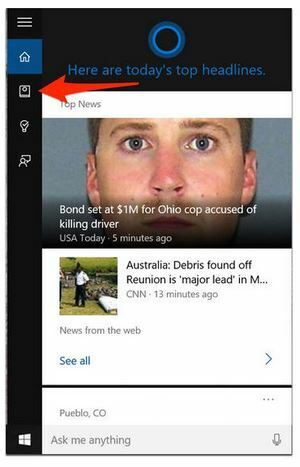 Cortana is a voice-activated personal assistant, and is one of the most highlighted Windows 10 features. Behaving much like Siri, you can get assistance in almost everything including traffic directions, set reminders, send emails, have it search files for you, or even tell you jokes. Here are the steps to help you enable Hey Cortana in Windows 10 powered computers and tablets. In Cortana, click on the Search box in the taskbar. When the Search windows appears, click on the Notebook icon. Now, click on the Settings icon. Once inside the Settings, you will find a toggle to enable Cortana: Let Cortana respond to “Hey Cortana.” Toggle it on. When enabled, you just need to call Cortana by saying “Hey, Cortana” and follow it with your command. Cortana will respond to your voice or just about anyone’s. If you want it to respond only to your commands, you can click on Learn my voice to help Cortana identify your voice. Cortana will give you six phrases to repeat so she can get familiar with your voice. Cortana has only debuted on Windows 10 in seven countries: the U.S., UK, China, France, Italy, Germany and Spain. In the next phase, it will be available to customers in Japan and Australia, and in English in Canada and India. Later this year, Cortana will also be available to Windows Insiders in Brazil and Mexico, and in French in Canada. You can read more about cultural savviness of Microsoft’s personal digital assistant here.